my first visit was today. excellent customer service and great good! I shall return! Customer service was simply stellar. Owner of the truck service gave me his card with his personal number to help me out around the area! (New to DC at the time and was completely lost as to where island culture in DC thrives). The food was STELLAR! Jerk chicken was flavorful, seasoned just right, and had the perfect amount of kick. Pepper sauce tasted like I was still in the islands! Made my first experience at a Nats game WORTH IT! The food is atrocious! The naan was cold and clearly made the day before!The chick peas is the not the right kind for the samosa. The samosa was horrible and soggy! Awful food, the only ingestible part of my lunch was the coke! If I could I would give them 0 STARS!!! Jerk chicken really needs to be on the bone not boneless chunks like this. The sauce was tasty enough. I got cabbage and coco bread for the sides and they were quite good. The food was excellent,the ginger tea was awesome as well. Get the curry chicken with rice (and the coco bread when they have it) - so hearty and awesome. Perfect in the winter to warm up and feel all cozy - though, you might have a small food coma at your desk. Seriously, it's so good, I get it every time they come by my office. 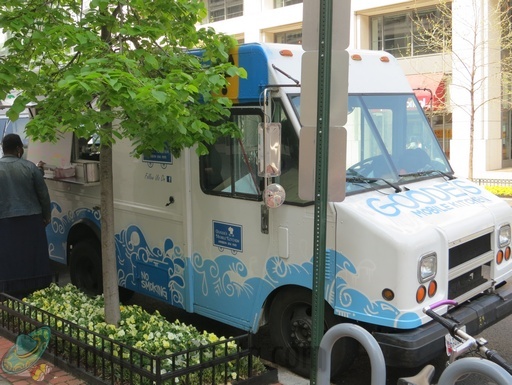 Goode’s Mobile Kitchen has been serving since July 2010, but had remained under the radar. I have recently been in touch with the owner and am happy to map them in real-time! They serve various American foods like Chicken Salad Sandwiches, Turkey Burgers and Crabcakes.